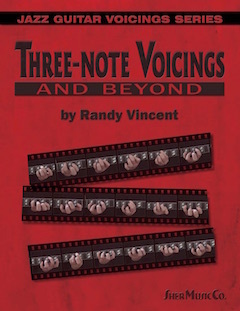 Three-note Voicings and Beyond by Randy Vincent | Sher Music Co.
A complete guide to three-note jazz guitar voicings and related topics for everyone from intermediate newcomers to jazz guitar up to very advanced players. 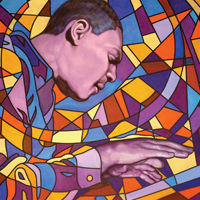 The book develops a unique “dynamic” concept of harmony where three independently moving lines team up to create beautiful harmonies that are valuable for comping, chord melodies and chordal jazz improvisations. Envious of pianists using lush “Shearing” style block chords? Here's a complete method to develop a realistic simulation on guitar. Plus much more! Hundreds and hundreds of examples in both music notation and guitar grids.